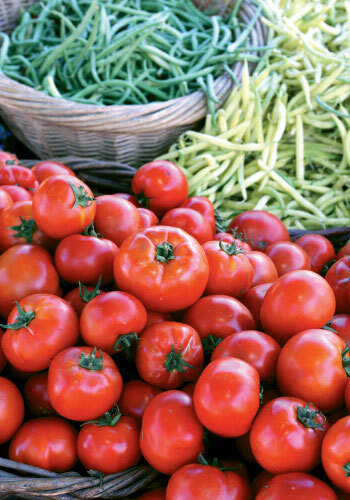 Surrounded by small growers and producers, Asheville, North Carolina, may be the Southeast’s most energized farm-to-table community. 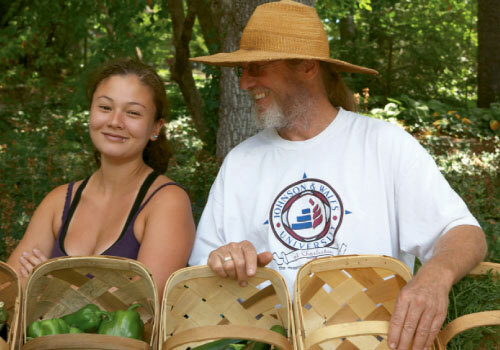 And since my family prefers vacations of the foodie variety over Disneyland-type destinations, when school let out for the summer, I decided to meet up in the French Broad River valley with my daughter, Marion, and her girls for some quality time exploring the “locavore” movement together. 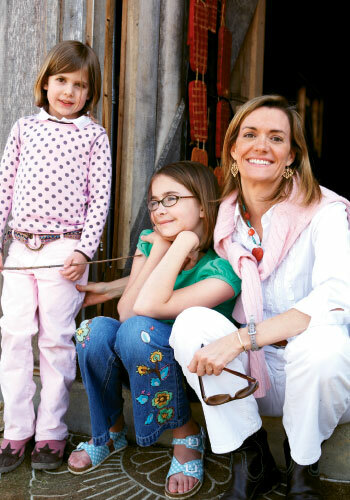 City girls to the bone, my granddaughters, Colesy (age 10) and Julia (age six), cut their teeth on restaurant spoons. Lacto-vegetarians by choice, they shun the fare of fast-food joints for a diet of grains, vegetables, fruits—and desserts—but know nothing of their provenance. Since the best way to learn about where food originates is to witness its journey from field to fork, we set out in search of Asheville’s sustainable feast. We rendezvoused in the afternoon at The Residences at Biltmore, a convenient “condotel” of handsome suites complete with modern kitchens. Stocked with supplies we’d gathered on the way into town from the myriad tailgate markets, the mammoth WNC Farmers’ Market, and the Greenlife Grocery’s bonanza of small-farm fare, we’d be able to take breakfast on our balcony. 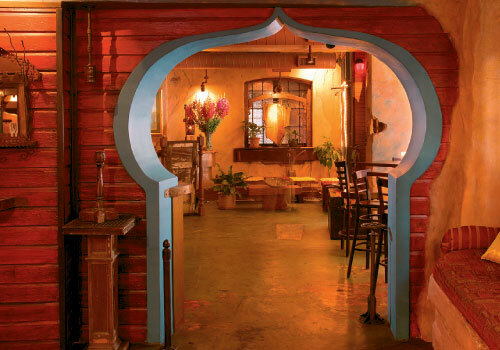 For dinner, we dined at Zambra, a Moroccan-themed restaurant known for its mezes and paellas. Owners Peter Slamp and Adam Bannasch created an unusual backdrop for a farm-to-table venue with a hip décor of columns and arches in vivid colors, but the food showcases their commitment. The chef made our junior vegetarians a kid-friendly Bibb salad, dressed with local cow’s feta and buttermilk vinaigrette and a colorful frizzle of pickled beets. Marion and I zeroed in on the trout; hazelnut-encrusted and lightly pan-seared in brown butter, the tasty triangles of filet were stacked on a bed of orzo and accented with fresh orange. We then collectively inhaled French toast pound cake with quince ice cream and a squiggle of mint syrup. Happily fed and fatigued from travel, we headed home to plush pillow-top beds for an early night in. 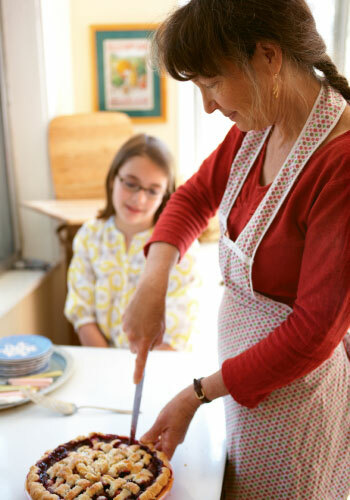 After an alfresco breakfast, our first stop was Slow Food board member Barbara Swell’s East Asheville log cabin for a class in “The Lost Art of Pie Making.” In a cozy kitchen complete with an iron woodstove, we sipped cider and hot tea while Barbara conducted a pie dough demo. 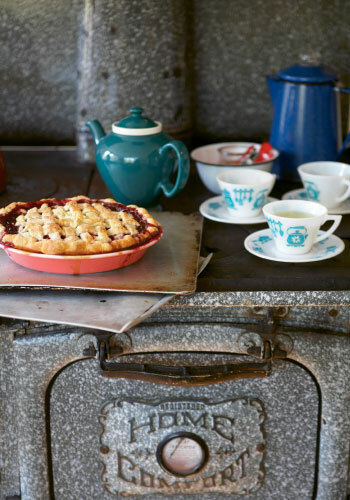 Donning vintage aprons, the girls each made mini berry pies with plenty of finger licking and flour flying. Colesy especially had been looking forward to the lesson, as she bakes at home. “Mrs. Barbara made making pie dough sound easier than it was,” she confided, “but after I got the hang of it, it was awesome—and the pie was delicious!” At a picnic table, we lunched on sandwiches from Greenlife, devoured the divine “blapple” (blueberry-apple) pie (recipe on page 99) that Barbara baked before we arrived, and chatted about the old-fashioned cuisine featured in her Log Cabin cookbooks and classes. 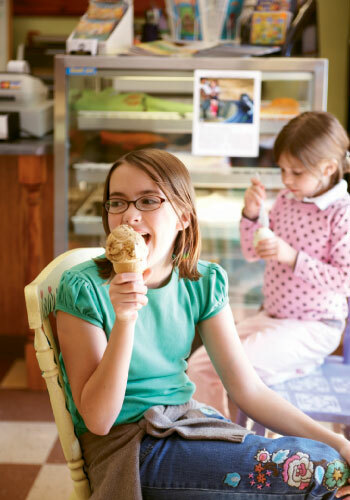 I wanted to investigate another recommendation in East Asheville, so over protests of too much sugar from mother Marion, we scooted around to The Ultimate Ice Cream Company to sample Lucia and Kevin Barnes’ Black Mocha Stout and Haw Creek Honey ice creams, a wow combo and interesting example of local sourcing. 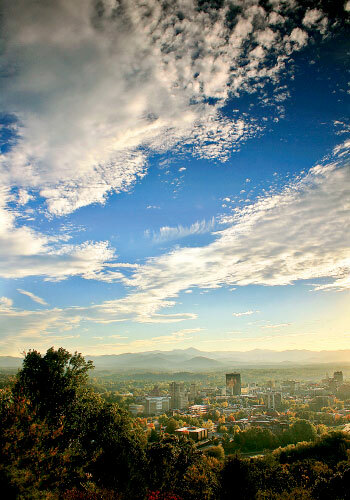 We then proceeded to our afternoon agenda of exploring downtown Asheville’s offerings from small-scale growers. We perused the Grove Arcade food shops as well as the farm and craft goods in the Portico Market’s outdoor stalls. Then a brisk walk down to Biltmore Avenue took us to the Double Decker Coffee Company. 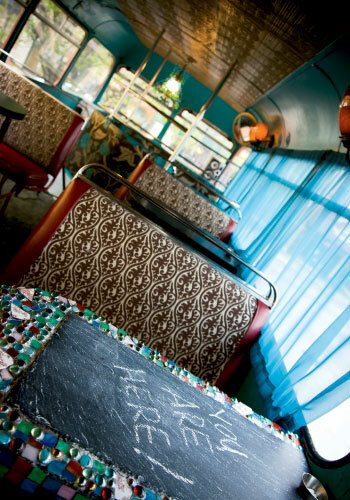 Housed in an authentic English bus, it offered locally roasted caffeine for the adults and a make-believe bus trip for the girls, who scampered up top to “drive.” On our way back, we hit South Lexington and Jael and Dan Rattigan’s fabulously famous French Broad Chocolate Lounge. The cognoscenti’s choice for artisan chocolates, it also features wines, locally brewed beers and roasted coffees, and to-die-for pastries. 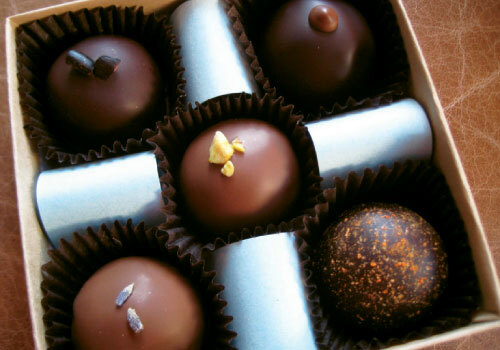 We selected an eye-popping assortment of handcrafted chocolates for after dinner. 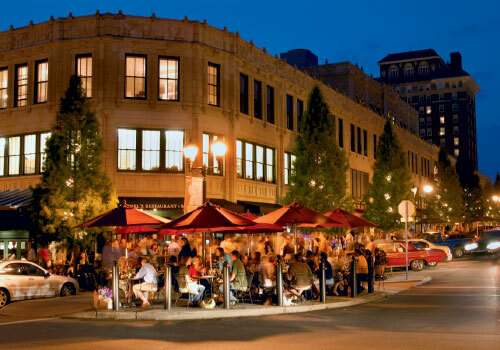 Our evening destination was the posh Market Place, where owner Mark Rosenstein, a leader in Asheville’s farm-to-table movement, has served local fare since 1979. Tiny red radishes on the menu mark dishes made entirely from ingredients sourced within 100 miles, such as that night’s succulent serving of Hickory Nut Gap beef, braised in Highland Oatmeal Porter and accompanied by creamy grits and pristinely fresh kale. We again fed our addiction to trout; here two fat filets of fish—mountain lake-raised at nearby Sunburst Farms—were complemented by an only mildly spicy chorizo-scallion spoon bread, tender late greens, and a silky sherry reduction. The girls devoured veggies and pasta, which Colesy declared “the best food I’ve had in my life.” With those French Broad Chocolates in our shopping bag, we bypassed dessert for an award-worthy selection of artisan cheeses from Spinning Spider Creamery, the Owen family’s farmstead goat dairy. 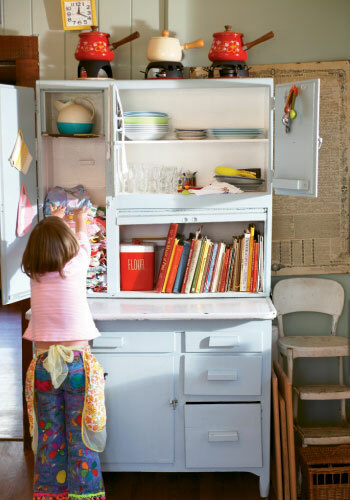 Taking a leisurely morning, we split up for age-appropriate activities. Marion and the girls headed to the century-old Biltmore Estate for a look at the four-acre kitchen garden and a little recreation at its River Bend Farm, a scene of life and work on the property in the 1890s, complete with farm animals for petting, hoops for rolling, crafts, and blacksmith demonstrations. Plus, Julia reported, “a chicken that chased you.” They lunched at The Bistro, a casual restaurant where the menu includes Hickory Nut Gap Farm’s pork, local honey and cheeses, and Biltmore produce. While my daughter and granddaughters burned off some energy at the self-sustaining estate, I decided to take some time out for a little lunch boost and headed to The Green Sage Coffeehouse and Café. 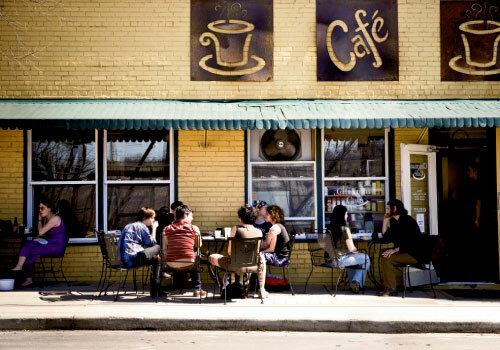 Ashevillians like their coffee, and the town has numerous coffee roasters and a passel of coffeehouses. Green Sage echoes the city’s new age vibe, with serious vegetarian, vegan, and even gluten-free options. I had been attracted by its mission statement, an excellent summary of the farm-to-table philosophy: “The Green Sage will lift the spirits and nurture the well-being of its customers through fair-trade organic coffee, natural and organic food, and ecologically driven business practices, and so doing will create a sustainable business....” I sipped fresh strawberry lemonade while noshing on a roasted red pepper soup and grilled aged cheddar cheese sammy combo. Afterwards, I reconvened with the girls, and we drove out to Warren Wilson College. With roots reaching back to 1894, when it began as a secondary level farm school with a mission of sustainability, Warren Wilson continued a farm component upon becoming a four-year college in 1967. 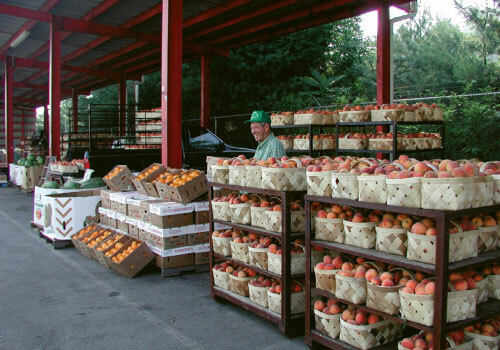 You’ll find its agricultural graduates in the area’s kitchens as well as on its land. Our destination was Michael Gentry’s Thursday evening vegetarian cooking class. Laid-back in general and extra gentle with Julia and Colesy, Michael led the participants through a menu that starred a chickweed salad made from plants we gathered from the student garden. “One of the students started eating the chickweed right out of the ground—I’d never even heard of chickweed before,” says Colesy, “but when I tried it, it was fantastic.” After collecting armloads of the greens (and getting pretty dirty), we headed back to toss together a small salad of mainly lettuce, chickweed, and a yummy balsamic vinaigrette. 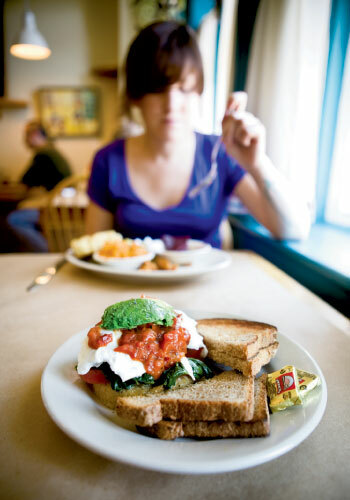 Knowing we’d need lots of energy for the day’s farm tours, we hit the Early Girl Eatery to carbo-load. Owners Julie and John Stehling met while working at Charleston’s Hominy Grill, owned by John’s brother Robert. Early Girl is similar in concept—equally casual, equally bustling—but with folk art on the walls and vegetarian and vegan options on the menu. We chowed down on celestial comfort food: heaping portions of heavenly stone-ground grits, flavor-filled local pork sausage, and ethereal biscuits. 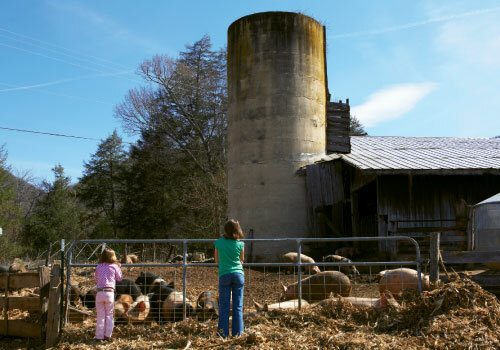 Annie’s cousin, Jamie Ager, and his wife, Amy, raise pastured pork, beef, and lamb on rolling farmland down the road at Hickory Nut Gap Farm. The girls scampered across the creek, with its pleasant picnic area, to see the calves and crowded the fence in fascination with the snorts and snouts of porcine antics. Then Jamie showed them the cow fields, where a mother and baby calf earned a chorus of “oohs” and “aahs.” Returning from the pasture, Julia cried, “The mom mooed at us, and Jamie said she was warning us to back off and telling her baby to be careful.” We packed our coolers with pork sausage, fresh eggs, and local jam from the Agers’ farm store, planning to take a taste of Asheville home. 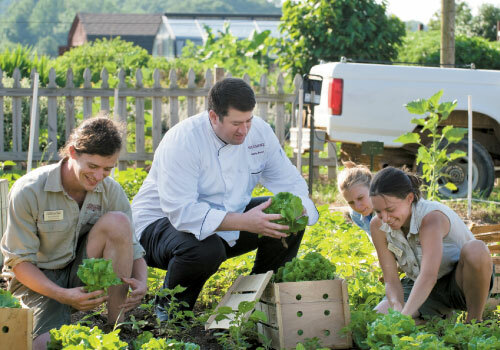 Our last destination was the Tupelo Honey Café, where executive chef Brian Sonoskus sources about 20 percent of the food from his own 12-acre farm, Sunshot Organics. The girls devoured the café’s specialty: sweet potato pancakes, light with buttermilk and laden with peach butter and spiced pecans. Marion and I were equally enthusiastic about the voluptuous “Veggie Bowl,” a mountain of tasty pinto beans, goat cheese-grits, sautéed greens, fried okra, and Sunshot salsa. When we parted—me for Charleston and my daughter and granddaughters for Charlotte, I should have checked eating off my list, but I’ll confess to slipping back by the French Broad Chocolate Lounge for the “Liquid Truffle,” a decadently dark hot chocolate sipped from tiny china cups. If the girls snuck one last indulgence, they’ve kept it a secret. 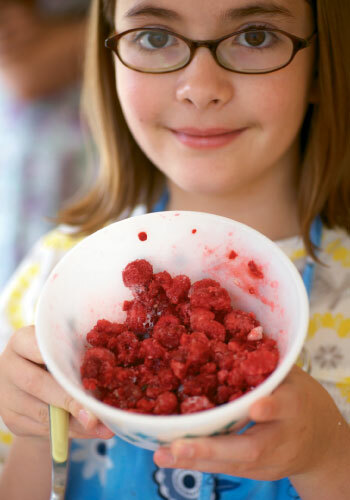 • Family Farm Tour 2009 (June 27 & 28, 1-6 p.m.): tour area farms. and a farm store open Wed.-Sat. 1-5 p.m. in summer and daily 9 a.m.-6 p.m.